LAVENWORTH — “I still remember that feeling I had,” said Sister Kathleen Marie Henscheid, the day she drove a client home from Welcome Central here. And he asked to be dropped off at a bridge. “That was his home,” she said. “And I thought, ‘I don’t want to leave you here.’ But he was satisfied with that. Welcome Central is an assistance center and transportation ministry for the poor in Leavenworth. Launched in January 2014 by the Sisters of Charity of Leavenworth, it acts as a clearing house for the disadvantaged and provides them with local transportation to social agencies and other essential services. 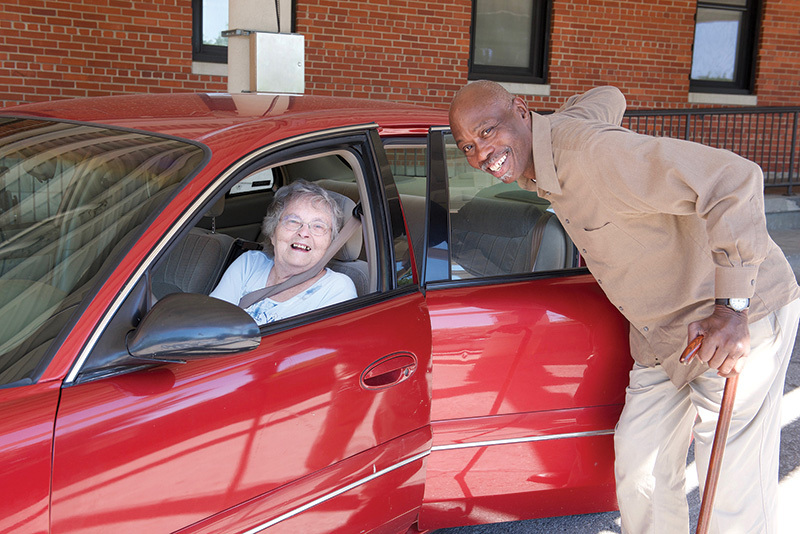 The ministry relies on volunteers to transport clients. Sister Kathleen, along with fellow Sisters of Charity Arthel Cline and Diane Hurley, are volunteer drivers. The idea for Welcome Central first came about when a committee assessed the needs of the poor in Leavenworth. So transportation became a priority for Welcome Central. And all three Sisters, who are retired, volunteered to help. Sister Diane had a similar motive. At 81, she feels she’s been “blessed with energy,” so why not use that blessing to help the poor? “There’s a lot of going back and forth through town,” she said. “I normally put on about 50 miles a day. The Sisters consider gas and wear-and-tear on their cars as part of a charitable contribution. And they all love being chauffeurs for a day. “They say there is no such thing as a free ride,” said Sister Arthel. “Well, there actually is, and it’s enriching to both the driver and the recipient. Most of the poor in Leavenworth live on the north side of town. But grocery stores and doctors are on the south side, so it’s a difficult situation in a town without public transportation. Welcome Central drivers are directed by a dispatcher who tells them where to take clients, and then calls them on their cellphones when clients are ready to be picked up. Clients come in a variety of packages, but the Sisters find they’re always grateful and friendly. “You get to know them,” said Sister Diane. “I would say if I were to take eight people tomorrow, at least five of them I have driven somewhere else in the past. “By and large, they are very real people. You’d think there would be a level of discomfort or even fear in carting around strangers, but these Sisters are made of tough stuff. “I do prison ministry,” said Sister Arthel. “And I’ve done that for about 30 years. So I think I have developed less of a fear of people that are considered most fearsome. “But I think the fact that they come through Welcome Central means they have to be OK. Rides can be long and sometimes people aren’t in the mood for conversation. The Sisters respect that. But sometimes people need to talk. And these drivers are always ready with an open ear and an open mind. “I love the fact that they feel free to tell their story,” said Sister Kathleen. “And whatever they say, they know I’m not going to tell other people. Clients often talk about their family, or the fact that they don’t have a family. “I’ve had them cry in the car,” said Sister Kathleen. “They tell me the story of how they have no place to go, or they don’t have enough food. Friendships are often formed on the ride through town. “You get to know them in a very comfortable, neighborly way,” said Sister Diane. “I might see someone on the street walking and they’ve been to the store or the library, and I’ll give them a ride. “Or someone will see me and wave — like a neighbor. The goal of this ministry is not to change lives, but simply to provide a service that makes life easier for the least among us. “This brings you into a more reality- based relationship with the poor,” said Sister Arthel. “And it’s on an everyday kind of basis. And often the biggest reward comes to the one providing the service. “It’s very rewarding to me,” said Sister Kathleen. “It doesn’t sound like it would be to the person driving, but I learn compassion and I learn that they’re just like I am, except their situation is different. The gratitude, sincerity and kindness of the clients they serve are inspiring. Welcome Central itself is a haven of good people from all faiths living the Gospel together. And that environment itself is inspiring. “I always look forward to going there,” said Sister Diane. “Granted, I am tired at the end of the day, and I’m glad to go home, but I’m always happy each morning I go. All three volunteers love this ministry because it is so in-step with the ministry of Jesus. “It deepens my faith when I see people who can’t even afford a car with such a good attitude,” added Sister Diane. “It definitely deepens my sense of gratitude. For these Sisters who drive the poor, whether it’s to the doctor, the food pantry, or home under a bridge, they’re evangelizing through acts of kindness and words of comfort. “And when you pick them up and you get a hug from them,” said Sister Kathleen, “it’s just a wonderful experience that I’ll always remember.